A wave of strikes has embraced Ukraine’s largest iron ore basin. May 4, 2017 workers of one mine refused to rise to the surface, and then all four mines of Kryvyi Rih Iron Ore Works (KRIOW). Similar, but not that large scale actions were held in some mines of “ArcelorMittal Kryvyi Rih.” May 10, 400 to 600 workers of EVRAZ Sukha Balka corporation had been staying in the mine faces. The biggest event was held on 1343 meters horizon of Yuvileyna mine. 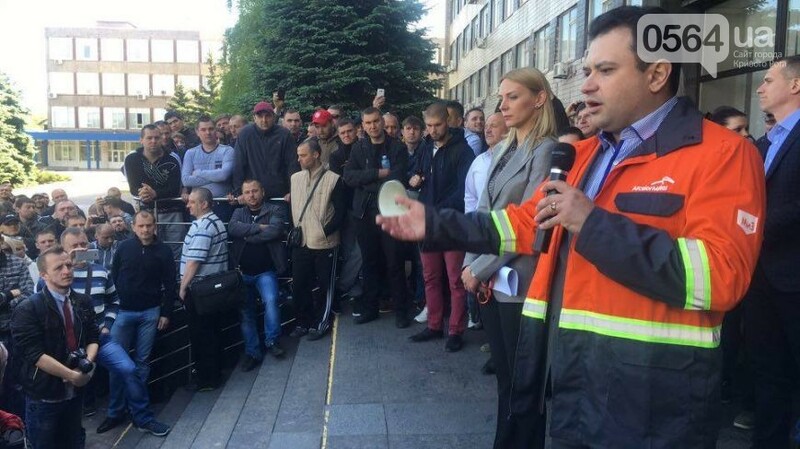 May 11, mass protest with similar requirements took place at “ArcelorMittal Kryvyi Rih.” About 1.5 thousand workers took almost four floors of administration building. All these companies belong to the fifteen largest taxpayers of this industry. Independent Trade Union of Miners of Ukraine (ITUMU) plays an important role in organization and coordination of these actions. The protest was also supported by “Social Movement” organization. Miners are demanding a salary of $ 1 thousand for employees of the key professions. For the first time this claim was voiced during the May Day demonstration, organized by ITUMU in 2017. May 1, 2017 the miners in Kryvyi Rih have even blocked traffic in one of the city districts. City authorities and police mobilized several buses of special law enforcers, but there were no clashes. Ukraine’s national television did not report on this event, but all managers and mine’s owners were well informed about what happened. At first glance, the requirement of such high wages in our impoverished country might seem naïve or utopian. Most of Ukraine’s workers would not achieve this level for at least few next years. However, the situation with salaries in the mining industry is different from the general situation in Ukraine. Thus, a skilled miner-sinker earns 10-20 thousand UAH, or 350-700 dollars. Thus, the salary of $ 1 thousand means of an increase of 50-150%. Given the recent two-fold increase in the minimum wage, it does not look fantastic. Despite all the warnings of liberal economists, raising the minimum wage has not led to substantial adverse effects neither in terms of accelerating inflation, nor in terms of reducing employment. On the contrary, a significant increase in tax revenues moderately reduced unemployment, increased capital investment, and overall economic growth begins. Anyway, the latest IMF report is relatively optimistic. Therefore, policy of increasing the minimum wage to an adequate level and monitoring informal employment not only paid off in fiscal terms but also gave impetus to the growth and reducing the shadow economy. As well as to combating corruption and attracting foreign investments. Thus, wage growth was found beneficial for all except the criminalized corrupt officials and businessmen. Usually, criticism is connected with the fact that some employers try to break the law and register “part-time” workers, who actually work as full-time ones. This is because the public institutions often do not have money to increase salaries, because their payrolls have not been increased. However, this criticism is not so much about raising the minimum wage, but about further opportunities. Double raising the minimum wage could also have a positive effect. We should criticize the government for one thing. While it is focusing on the legitimization of employment and increasing the minimum wage, it is also trying to divert attention from the biggest problem of the Ukrainian economy, avoidance of large business tax revenue and withdrawal of export industries of the country. The scale of this phenomenon is commensurate with the size of the state budget of Ukraine and exceeds the annual budget of the Pension Fund. At least the data of Center for Social and Labor Research indicates that the amount of exporters’ profit, which undertakes Ukraine’s tax system, is funneled into 5 most popular offshore jurisdictions. These are more than $ 5 billion per year, which corresponds to more than $ 1 billion of unpaid income tax annually. The numbers below are estimates that include calculations to selected industries and jurisdictions. Accordingly, the actual amount of tax evasion and output gains could be twice as high. Complete cessation of tax exemption for exporters’ profits would bring state resources, which would be enough for the rejection of IMF loans. This would give another perspective for inevitability and desirability of social cuts and infrastructure spending. However, it seems that nothing can make Ukraine’s authorities resolve the issue. Even the IMF is concerned about the ability of extremely impoverished Ukrainian people pay enough taxes to repay government loans, so it even began to “hint” about the expediency of “broadening the tax base” for export. However, it turned out that this is the limit, which cannot be neglected even by the “lender of the last resort.” Multiple factions made clear that if the IMF insists, Ukraine will be forced to abandon cooperation with the Fund and, if necessary declare a unilateral default. Exemption from export business taxation and providing opportunities to freely funnel money to the offshores is the foundation of modern Ukrainian economic and political system, the basis of the entire system of oligarchic monopolies and Ukraine’s corrupt networks. The problem of “offshorization” of Ukrainian economy and transfer pricing have been discussed for a long time. The first attempts to settle the matter took place before 2010, when the notion of “normal price” appeared in the legislation. However, the path from the wording of institutional principles to actual use was very long. The law on transfer pricing, which was to prevent fictitious price undercutting for exports, was approved during Yanukovych’s presidency, in July 2013. The law was to take effect from September 2013, but its introduction was delayed until 2014. During Euromaidan, the power cared about other things, not about pricing. Subsequently, due to the “critical situation” in the country, Parliament actually delayed its entry into force for another year. Why in terms of the critical situation, it was necessary to create conditions for the smooth withdrawal of capital from Ukraine? May 13, 2014 Oleksandr Turchynov signed amendments to the law on transfer pricing, which significantly weakened the responsibility, especially for large exporters. In 2015, when the law on transfer pricing became operational, it has been amended significantly, so it became rather symbolic. Volume of the controlled operations significantly increased, the fines reduced, methods of calculating prices have changed, the ranges extended. If the exporter fictitious paper supply share for smaller parties, the tax legally can not even check the same operation. In any case, it was also introduced a moratorium on any check. In the case of KRIOW, under the old law, the penalty for transfer pricing in 2016 could amount to 200-400 million or 5% of sales at market price. Under the new rules, the fine cannot exceed 320 thousand UAH or 200 minimum wages, that is one thousand times smaller. However, even this ridiculous penalty is not applied. You cannot say that something has changed for the worse since the old law on transfer pricing in 2013 has never been used. The problem is that despite the revolutionary developments in this key issue, nothing changes. In the key areas, mining and metallurgical, agriculture complex, a slight decline in output of capital was observed only in 2014, during the most active phase of the war. Billions of dollars annually have been funneled from Ukraine without taxation, and these schemes do work today. Nothing changes, except salaries, which in the years 2014-2015 fell twice and did not exceed the level of 2013in dollar terms. Consequently, wages fall, profits of the oligarchs increase, the volumes of output in offshore profits, despite all the laws, increase. Selling price of ore on KRIOW, which appears in the statements for 2016, is twice lower than the market price, and is a typical phenomenon. So, “drawing” in the reports UAH 4.5 billion in revenue by 2016, KRIOW owners actually brought to offshores in 2016 is at least as much and are going to bring in 2017. Legislation on transfer pricing does not work and has no chances to be used. The state system would strongly inhibit control measures of transfer pricing. It destroys Ukrainian economy. Thus, the requirement to increase salary to 1 thousand dollars for KRIOW workers would create added value in the amount of UAH 5 billion a year. And not only because the wages of miners and steelmakers in the EU is much higher than 1 thousand dollars. Increasing salaries up to 1,000 US dollars per month is equivalent to that Kyvyi Rih Iron Ore Plant owners would funnel to offshore one-third less money. Every additional US$ 1000 paid as wages means saving this money from going to offshore.